By the time you read this I'd have already left the verdant shores of Ireland forever. Its been a fulfilling, satisfying and virtuous 4 years here in this tiny speck of earth in the North Atlantic. Ireland has formed a strong connection with my life ever since I landed here in August 2006. Bought my first apartment after reaching here, and ironically the apartment is all set for handover this very month! My piece of heart, my little daughter, was born here in Ireland last year. The last one especially creates a reason why I'll never be able to cut the chord with this Western European island nation. I'm leaving Ireland for strictly personal reasons. Oh, I almost missed telling that we are moving to exactly the opposite side of the globe, to Australia. From the cloudy, wet and cold counties outside Dublin to the warm, sunny and bustling shores of Brisbane, Queensland, Australia. The weather being one of the main reasons we're moving. There is virtually no outdoor life in Ireland for us. Ah, too bad I'm a touch more warm-blooded than my fellow species. We have some personal and professional reasons as well for the big move...Australia is far supportive to migrants than European laws and is also better for my career prospects. The Irish has taught me too many precious lessons in life. I'd be lying if I say I'm not a better person after mingling with the local folks. The pubs, the bars, the motorways, the Guinness, the smoking/ drinking women, the city... all unique and interesting. One thing they may learn from others is how to keep their tradition. 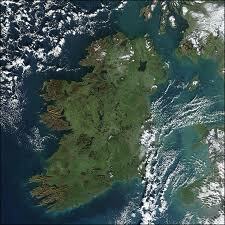 Ireland has allowed the local language, Irish, to wither away and die. Though there are efforts to keep the language alive its almost like a dead language. No one really cares about it. Well, that's not the way Germans treat German language, Spaniards treat Spanish or the Italians treat Italian. Anyway folks, it might be a touch late when I get a look back at this space. New country, new housing, getting phone and broadband connections, settling and acclimatising in... hmmm, may take a while. Meanwhile I'll try keep the blue-bird fed and groomed. You're following my bird aren't you? If not you're just a click away!